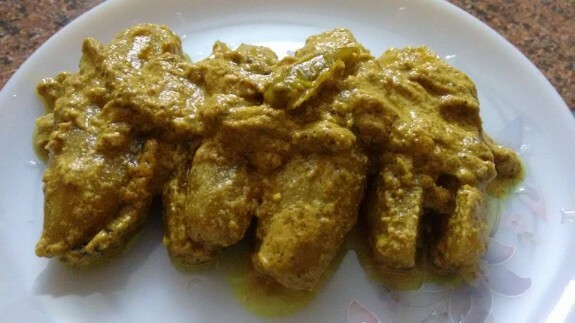 Doi Potol is a popular Bengali recipe. You can add more or less spice in this recipe as per your choice. Here I make not so much but little more spicy doi potol that can be best suitable for any festival or occasion and you will grab lots of compliments from your family or guests. So, try this delicious Doi Potol at home and serve with rice. 1. Scrap the skin of the potol and cut them into halves from both end. Marinate them with some salt and turmeric powder. 2. Take a small bowl and add turmeric powder, cumin powder, garam masala powder, crushed black pepper powder, salt and red chilli powder. Add little water to make a paste. Keep this aside. 3. Heat oil in a pan and lightly fry the potol. 4. In the same pan, add some oil and little ghee. Then add cardamoms, cloves, bay leaves and cinnamon stick. Saute for few seconds. 5. Now, add ginger paste and again stir it. 6. Now, add the spicy paste and sauté for few seconds. Add the fried potol into the pan. 7. Mix everything well and cooked for few minutes until oil oozing out from sides. 8. Whisk the yogurt and sugar in a blender and add it to the pan after 4-5 minutes. Cook for another 5-8 mins on low flame or until potol become soft. You can add little water, if you want. 9. When the gravy coated with the potol well, add little more garam masala powder and ghee and mix well. Cook for another 1-2 mins. 10. Switch off the flame and serve it hot.